As the protest rolls on and turns ugly, I wanted to write about how respectful the protest has been. A number of the military have been nicknamed “watermelons” as they wear green but are red shirts on the inside. The red shirts understand the police and military are doing their job and many among the police and military respect the red shirts protest and even support it. 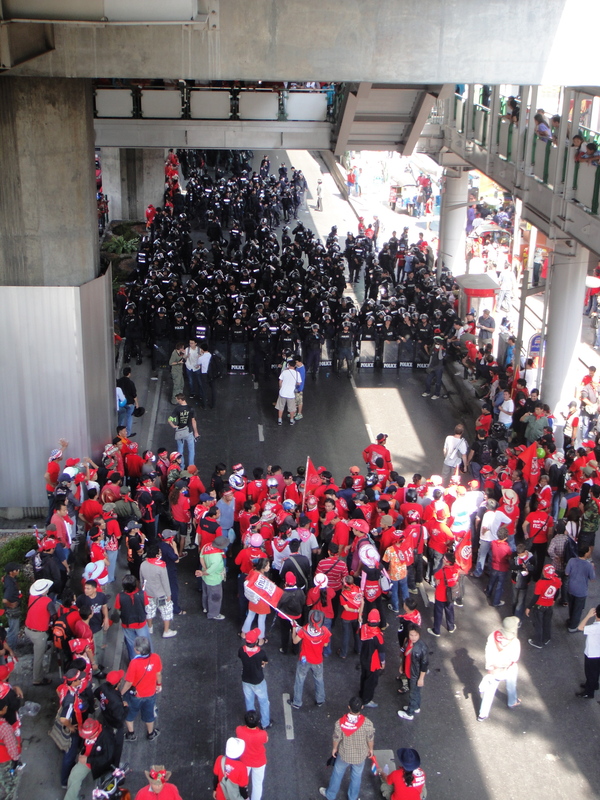 Watching the face-to-face confrontations between the red shirts and police is very different from the USA. Over the past few days when the confrontation, which has generally been a lot of pushing, is over, the red shirts will applaud the police as the police walk back to their trucks or base through the demonstration. Fascinating. One moment that are face to face and at odds with each other, the next moment the police are walking through the demonstration without issue. This is a tribute to the culture, showing that violence is not desired or wanted as part of the protests. But, things have turned ugly. The red shirts have continued to block the main commercial district, had mobile rallies and went into parliament, a television station and attempted to block the police hospital and break into an army barracks. The government has to push back or be seen as weak and lacking authority. The government has not wanted to use force; I think they have been waiting for the red shirts to justify the use of force. The feeling was that nothing would happen during the workweek, but this weekend the government would become more aggressive. 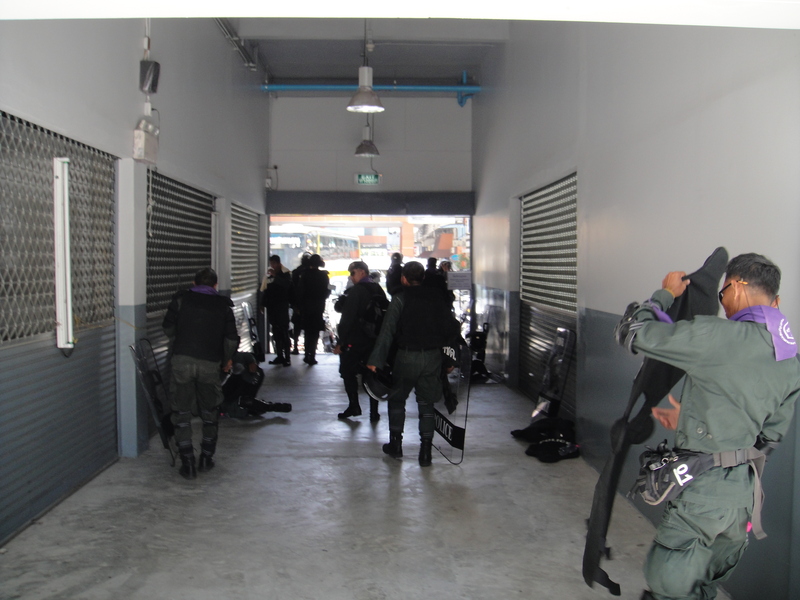 Saturday was the beginning of the crackdown. 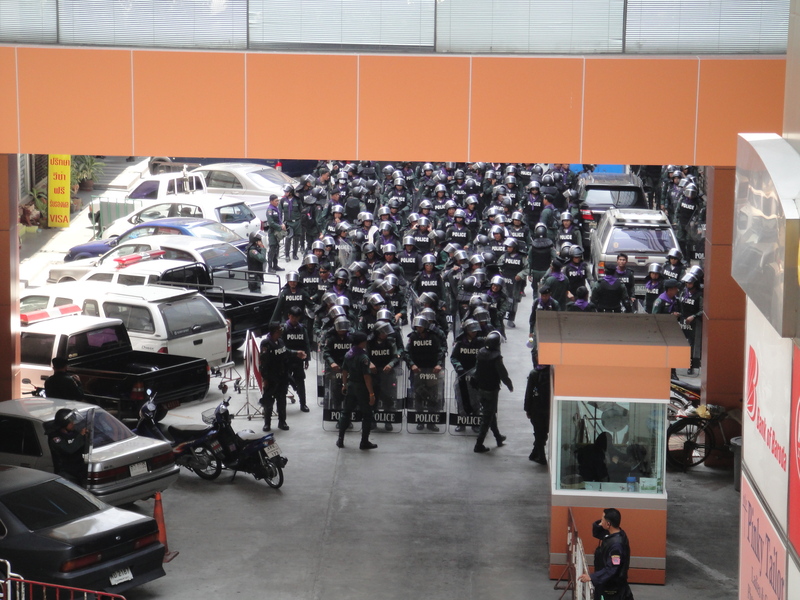 As I left my apartment at lunch and headed into a small breezeway that is a cut through to Sky train, I encountered around 1,000 policemen; by encountered, I mean I was walking in the middle of them. A few hours later I tried to return via Sky train, but it was closed. A few hours later- after one confrontation, waiting for orders. This stand off went on for 3 hours. I walked home, through the middle of the red shirts. It was tense, I was nervous. The red shirts were very nice, but no more dancing and singing, they are preparing for the arrival of the military and still have close to 8,000 people. 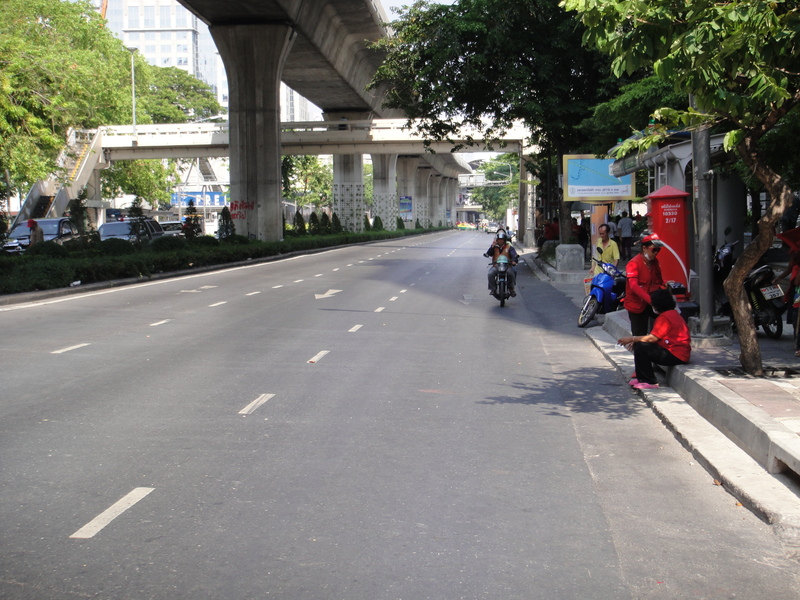 The red shirts were putting bags over all traffic cameras, blocking the government from seeing what they were doing. 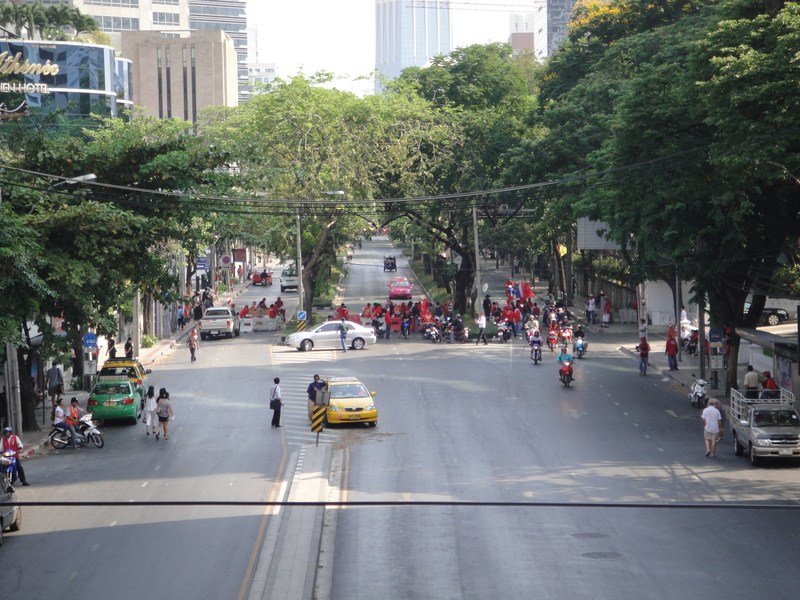 The red shirts blocked the roads leading to the commercial district, but this time there were no red shirts celebrating in the streets, the streets were clear. I watched the stand off between the police I had seen earlier and the red shirts for around 20 minutes, I left as things continued to escalate. The media says tonight is the night for the crackdown, the red shirts are well entrenched and are not going to retreat. The military and police are lining up in the streets, it is very dark and very, very quite. This entry was posted in Bangkok, Politics, Thailand and tagged Bangkok Safe, Red Shirts April 2010, Red Shirts in Bangkok, Red Shirts Protest. Bookmark the permalink.